Easy color-and-wear project. 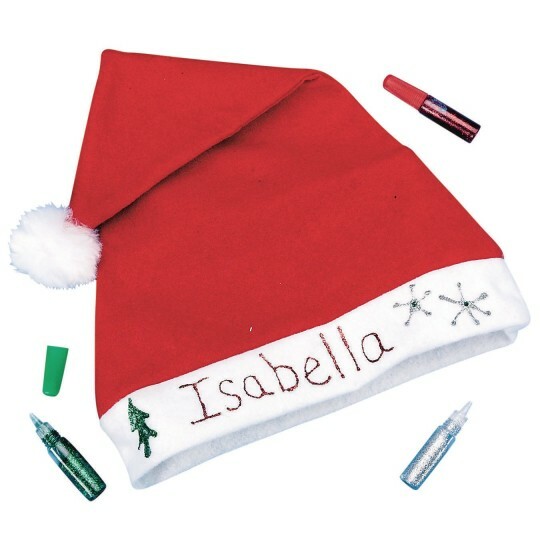 Includes hats and glitter glue to decorate. 11-1/2" x 17". We used these hats in a group of Seniors. We personalized them and decorated them with the supplies included and it went over great. A lot of the hats got used as decorations in Resident's rooms and are conversation pieces. These are cheap enough for large craft activities where everyone can take one home however the paint takes much longer than normal to dry and the paint pens provided don't hold much. It took more than one pen to just write Amanda with thin lines. I tried fabric markers as well and they work on the red but not well on the white portion. The product is good I think that larger containers of glitter would be nice as the kids really wanted to do elaborate decorations. Ho Ho Ho! Holiday Cheer on a Budget! We bought enough of these Santa hats for every patient in our psychiatric facility to enjoy. They were a big hit for decorating or for just celebrating the season! Thin fabric not super plush but conveys the festive atmosphere for a larger group.